Okay, so first things first. Everybody breathe. I was right there with you on that ending: shocked, confused, and quick to fume that The Walking Dead would attempt to pull off another dumb fake-out like that, especially with only one episode left in the season. Between killing off Denise last week, as well what we’ve heard about the finale’s big moment, The Walking Dead seems inescapably broken with regards to which characters it will, or won’t kill, and when. All of that said, I’ve re-watched the closing moments a number of times, and while blood spurts from Daryl’s direction covering the camera are abominably misleading, it does seem more likely that the riot-inducing favorite was merely shot in the arm, or somewhere survivable. The bizarre placement of Dwight’s “you’ll be alright” line may have even been intended as assurance fans shouldn’t overreact, but the twist’s poor timing and construction cements a widening gulf between fans. and the kind of manipulative storytelling The Walking Dead has fallen into. It’s a shame that Daryl’s “death” has to dominate the conversation, too, as “East” made an otherwise serviceable hour of The Walking Dead, and not in a disparaging way. Carol’s decision to leave Alexandria behind still ranks as oddly selfish, given she had to realize that people would put themselves in danger* by coming after her, but Melissa McBride put some strong work into the moments of Carol’s realization she’d need to (and could) kill the Saviors on the road. Don’t ask me how she managed to conceal, hold or aim that machine gun within her sleeve, while presumably that lone survivor will catch up with her and Morgan next week, but the sequence went a long way toward showing Carol not in the right mindset. *Forget leaving Alexandria without one of its best fighters at a time of need; why wouldn’t Carol just tell everyone she needed to leave? Sure, Daryl, Rick and whomever would try desperately to change her mind, but it isn’t as if they would physically stop her, if it came to that. Leaving the way she did just puts everyone else in danger by guaranteeing they follow. Morgan's insistence on bringing sticks to a gunfight, however, remains entirely his own. For the second week in a row, Carol’s state of mind looms over the hour without actually spending too much time with the character herself, “East” lending much more time to the conflict between Rick and Morgan as they attempt to track her down. On the one hand, the two haven’t had very much one-on-one time since October, and “East” made some reasonable points on either side, to feature Rick looking back on Carol’s prison kills as something he’d thank her for today, even as he tells Morgan that some of the “wrong” things he does haven’t yet pulled him down. Both have valid insights into Carol’s current state as well (pity she’s not there to speak for herself), and it was similarly of interest to have Morgan finally air his experiment with the Wolf, something you’d almost forget Rick never learned about. 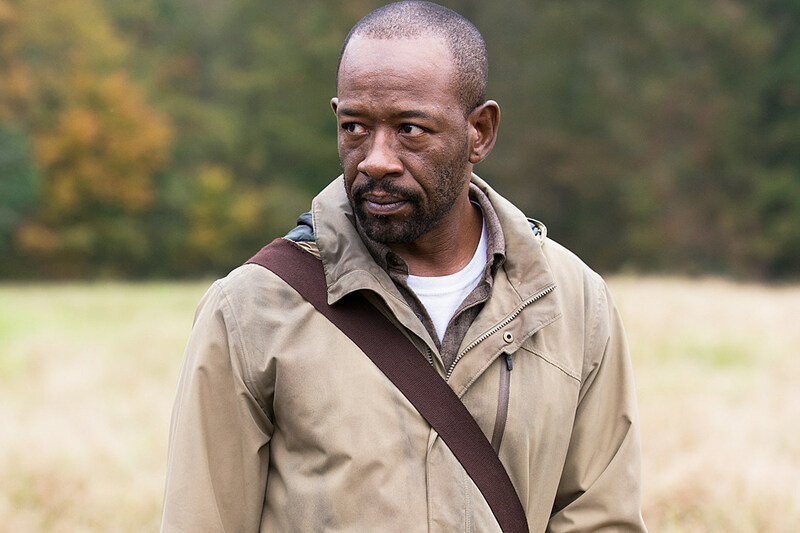 Morgan’s not entirely wrong, that in a roundabout sense, the universe rewarded his “taking chances” by the Wolf saving Denise, who in turn saved Carl, and that clearly seems to reach Rick. Of course, there’s no indication that Denise wouldn’t have survived the town’s ordeal anyway, had the Wolf never been there at all, but it makes sense to get Rick and Morgan to a point of understanding, cutely buttoned by the protein bar admission. On the other side, it’s funny that an hour so preoccupied with Carol’s fate elapses completely outside of Daryl’s knowledge, given his hot-headed venture to track down Dwight; another mission that seems to put the whole town in jeopardy at a time its best fighters should protect the homestead. And whatever we make of those final moments, it likely bodes worse for Glenn, to end up a prisoner shortly after what looked like a final goodbye of sorts with Maggie, whose fresh haircut and labor pains would seem to point her in a more independent direction. That’s a hell of a predicament to carry over into next week’s finale, to have four captured, with Carol missing and potentially wounded as well, though I have no idea why producers felt the bizarre closing panic with Daryl was the right way to end the hour. Rick’s looming overconfidence seems very much to set us up for a rude awakening next week, but it’s looking less and less likely The Walking Dead will play fair with its fans regardless. I don’t know how many more times I can express this: Opening in media res, before flashing back X number of hours, is boring. If you don’t know how to open an episode compellingly, tell a different story! That song playing over the Alexandria montage was Johnny Cash’s “It’s All Over,” if you were wondering. Yep, that looked like Lucille carved into the grip of a gun Carl picked up. Hey, remember Carl? Come on, Abraham and Sasha. Don’t walk each other to work when you know Rosita’s going to be right there. Bad form. Can we get some more distinct clothing/appearances for the Saviors? I would love a detailed breakdown of how Carol managed to shoot through her sleeve, given the position of her hands, and hit so many without being fired on. I know you’re a great shot, Daryl, but firing anywhere near Rosita’s head is vastly irresponsible. Alright, random guy looking for his horse, and a trail of fresh-looking walkers. You have my curiosity. Could definitely do with more Rick and Abraham scenes. How pregnant is Maggie supposed to be? Those couldn’t realistically be labor pains, just a reason to put her on the road to Hilltop next week, right? The Walking Dead will return on April 3 with the 90-minute Season 6 finale “Last Day on Earth”, airing at 9:00 P.M. on AMC.